Fundamentally, a methodology can be understood as a set of rules or principles. It can include “tools” and/or practices which can be effectively used to fulfil a predetermined process and achieve specific goals. A methodology is more like a doctor’s prescription. You are required to follow it exactly in the manner suggested, and not deviate from the “instructions” stated therein. A framework, on the other hand, is “loose” and merely offers a skeleton or an incomplete structure that leaves sufficient “room” for other methods and practices which can be “incorporated” into it. A framework basically provides a structural support for other project related activities. The process flow is “strengthened” by the framework’s “structure”. Is Scrum a methodology? No. Even though people still refer to Scrum as a methodology, the reference, in fact, in not appropriate. Scrum is a framework. It provides a “skeleton” which helps development teams to choose their own production processes, how the management “desires” to execute the project, and decide what kind of roles the team members should “play”. The Scrum framework offers specific guidelines which the Agile team should stringently follow. Scrum is an Agile based framework which can be easily applied in almost any type of project. Scrum, however, is most commonly used for software development, and is a very popular environment for developing wide-ranging software based products. The framework is ideally suited to project conditions where the product may undergo rapid changes, or may have highly emergent requirements. Agile Scrum is fundamentally based upon three basic principles. Product owners plan and decide what needs to be developed, or built, in the next couple of months or less. They plan the project, work out the project dynamics, and design a project process flow that is most suitable for their unique project related requirements. 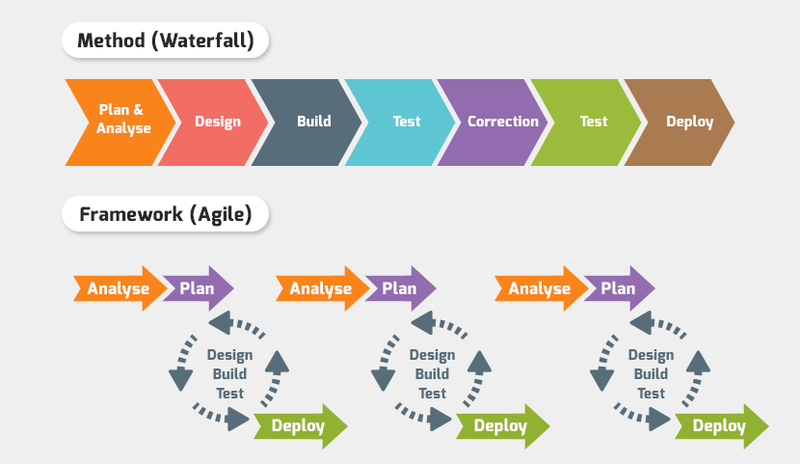 The development team builds the product in stages through the sprint iteration cycles. At the end of each cycle, the PO and stakeholders verify that the development is OK. The team ensures that important product features are developed first, followed by less important ones. Scrum masters make sure that the Scrum process is followed, and implemented properly. If the team faces any issues, technical or otherwise, the scrum master resolves the issues. Project work in Scrum begins with the creation of a master list known as a product backlog. The product owner creates a list which contains all the features required to develop the product in totality. Once such a list is prepared, the actual Scrum process can begin. Scrum functions through repetitive iterations known as “sprints”. Each sprint traditionally extended from two weeks up to a month. However, Scrum has now evolved to last for seven to ten days owing to rapid project development requirements and dynamically changing market trends. Scrum development methods suggest that each sprint should begin with a short meeting, known as a daily scrum meeting, in which the entire team plans what it proposes to “do” on the particular “working” day. The entire product is developed in short bursts of development activity known as sprints. The product is broken down into its constituent features, and each feature is developed as a user story in a sprint. Moreover, each feature, in the form of a user story, should be “successfully” developed such that it does not have any flaws or bugs. Each sprint, in short, should only produce “shippable” products. Once the feature is developed, it has to be verified and cleared by the product owner and the stakeholders. A special event known as a sprint review meeting is conducted after each sprint to ascertain the development carried out by the Agile team. The PO plays an important part in this event. During the Scrum Agile process, once the entire team feels certain that the features developed meet the acceptance benchmarks, the development is presented to the stakeholders in the sprint retrospective meeting. The event is important, since it also offers an opportunity for everyone involved with the project to “think back” and reflect upon what things worked well in the last sprint, what kinds of issues affected the development activity, and how the team can change its working so productivity can be increased. The entire process is repeated again-and-again until the product is developed entirely and the project is completed. It is possible to avail Scrum benefits, but it is possible only when the framework is properly implemented in the project.